October 27, 2015 - "Press Releases"
Infrared Heating Technologies recently designed, manufactured, tested, shipped, and installed, an electric infrared and convection combination conveyor oven, cooler, and controls system for de-bubbling, drying, curing, and cooling a screen printed fluoroelastomeric coating on a stamped stainless steel automotive head gasket layer for a major automobile parts supplier. The process includes de-bubbling the screen printed coating with a high intensity short-wave electric infrared section, levelling the coating, drying the coating with a combination of medium wave electric infrared and convection, curing the coating with medium wave electric infrared, and cooling the coating with a heat exchanged forced air cooler. Infrared Heating Technologies manufactures a wide variety of custom heater, industrial ovens, and furnace systems for specific processes. Heating technologies include short wave electric infrared, medium wave electric infrared, long wave infrared, electric convection, gas fired convection, Silicon Carbide, Rod Over-Bend (ROB), and others. 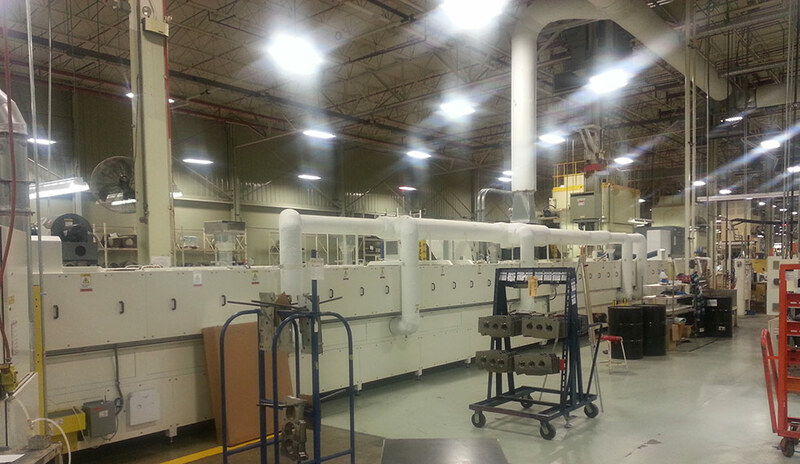 Infrared Heating Technologies manufacturing facility is located at 2010 HWY 58, Oak Ridge, TN 37830, and all custom heater, oven, and control systems are manufactured in the USA. Call (865) 574-9784 to speak with an applications engineer or email info@infraredheating.com with your specific machine and process requirements.